Specialised Orthotic Services are proud to have donated a PPod for Sophia Edwards, Luston. At age 92 Sophia’s health began to fail and could not cope living alone. She has since moved to Waverley House Care Home, Leominster. PPods in spite of their bright colours are suitable for all ages. 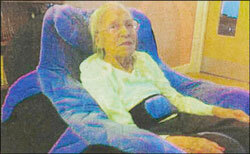 Sophia has been very pleased with her new PPod which allows her to sit more comfortably and live life to the full. Click the header to view the original article. FORGET your iPods and ipads, a Leominster lady is sitting pretty thanks to a P-Pod chair made especially for her small frame. Sophia Edwards, from Luston, worked until she was 72 as a local home help. “Sophia has settled in really well, but being a very small lady has its problems. My staff team and I felt her size was sometimes stopping her enjoying life to the full”.